Beijing opera or Peking opera (Simplified Chinese: 京剧; Traditional Chinese: 京劇; pinyin: Jīngjù) is a form of Chinese opera which arose in the late eighteenth century and became fully developed and recognized by the mid-nineteenth century. The form was extremely popular in the Qing Dynasty court and has come to be regarded as one of the cultural treasures of China. Major performance troupes are based in Beijing and Tianjin in the north, and Shanghai in the south. The art form is also enjoyed in Taiwan, and has spread to other countries such as the United States and Japan. In recent years, Beijing opera has attempted numerous reforms, including improvement of performance quality, adaption of new performance elements, and the introduction of new and original plays to boost sagging attendance. Some Western works have been adopted as new plays, but a lack of funding and an adverse political climate have left Beijing opera's fate uncertain as the form enters the twenty-first century. 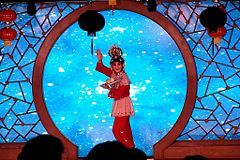 The earliest Chinese name for Beijing opera was a combination of the Xipi and Erhuang melodies, “ Pihuang.” The art form has been known by many other names in different times and places. As it increased in popularity, its name became "Jingxi," which reflected its start in the capital city, Jing, and the form of the performance, Xi, an opera. From 1927 to 1949, when Beijing was known as "Beiping," Beijing opera was known as "Pingju" to reflect this change. Finally, with the establishment of the People's Republic of China, the name of Beijing opera in mainland China became "Jingju." In Taiwan, this type of opera is known as "Guoju," “national opera,” reflecting disputes over the true seat of the Chinese government. According to tradition, Beijing opera was born when the Four Great Anhui Troupes came to Beijing in 1790. Beijing opera was originally staged only for the entertainment of the court, and only later became entertainment for the general public. In 1828, some famous Hubei troupes came to Beijing, and frequently performed on stage together with Anhui troupes. The combination gradually formed Beijing opera's main melodies. Beijing opera is generally regarded as having been fully formed by 1845. Although it is called Beijing opera, its origins are in the Chinese provinces of Anhui and Hubei. Beijing opera's two main melodic styles; Xipi and Erhuang originated from Anhui and Hubei operas. Much dialog is also carried out in an archaic dialect originating partially from those regions. It also absorbed music and arias from other operas and musical art forms. Some scholars believe that the Xipi musical form was derived from the historic Qinqiang opera, while many conventions of staging, performance elements, and aesthetic principles were retained from Kunqu, the form that preceded it as court art. Thus, Beijing opera is not actually a monolithic form, but a coalescence of many older forms. However, the new form also introduced its own innovations. The vocal requirements for all of the major roles were greatly reduced for Beijing opera. The Chou, in particular, rarely has a singing part in Beijing opera, unlike the equivalent role in Kunqu opera. The melodies that accompany each play were also simplified, and are played with different traditional instruments than in earlier forms of opera. Perhaps the most striking difference from older forms was the introduction of true acrobatic elements into Beijing opera. The form grew in popularity throughout the nineteenth century. 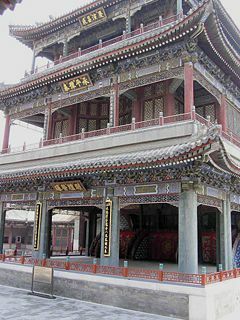 The Anhui troupes reached their peak of excellence in the middle of the century, and were invited to perform in the court of the Taiping Heavenly Kingdom that had been established during the Taiping Rebellion. Beginning in 1884, the Empress Dowager Cixi became a regular patron of Beijing opera, confirming its status above earlier forms like Kunqu. The popularity of Beijing opera has been attributed to the simplicity of the form, with only a few voices and singing patterns, which allows anyone to sing the arias themselves. Beijing opera was initially an exclusively male pursuit. The Qianlong Emperor banned all female performers in Beijing in 1772. The appearance of women on the stage began unofficially during the 1870s, when female performers began to impersonate male roles and declared their equality with men. They were given a venue for their talents when Li Maoer, himself a former Beijing opera performer, founded the first female Beijing opera troupe in Shanghai. By 1894, the first commercial venue showcasing female performance troupes appeared in Shanghai. This encouraged the formation of other female troupes, which gradually increased in popularity. As a result, opera artist Yu Zhenting petitioned for the lifting of the ban against female performers after the founding of the Republic of China in 1911. The petition was accepted, and the ban was lifted in 1912, although male Dan continued to be popular after this period. After the Chinese Civil War, Beijing opera became a focal point of identity for both sides. When the Communist Party of China came to power in mainland China in 1949, the newly formed government moved to bring art into line with Communist ideology, and "to make art and literature a component of the whole revolutionary machine". Dramatic works without Communist themes were considered subversive, and were ultimately banned during the Cultural Revolution (1966–1976). Among the eight model plays eventually retained during that time were five Beijing operas. Notable among these operas was The Legend of the Red Lantern, which was approved as a concert with piano accompaniment based on a suggestion from Jiang Qing, wife of Mao Zedong. Performances of works beyond the eight model plays were allowed only in heavily modified form. The endings of many traditional plays were changed, and visible stage assistants in Beijing opera were eliminated. After the end of the Cultural Revolution in the late 1970s, traditional Beijing Opera began to be performed again. Beijing opera and other theatrical art forms were a controversial subject both before and during the Twelfth National People's Congress in 1982. A study carried in the People's Daily revealed that over 80 percent of musical dramas staged in the country were traditional plays from the pre-Communist era, as opposed to newly written historical dramas promoting socialist values. In response, Communist party officials enacted reforms to curb liberalism and foreign influence in theatrical works. After the retreat of the Republic of China to Taiwan in 1949, Beijing opera there took on a special status of "political symbolism," in which the Kuomintang government encouraged the art form over other forms of opera in an attempt to claim a position as the sole representative of Chinese culture. This often occurred at the expense of traditional Taiwanese opera. Due to its status as a prestigious art form with a long history, Beijing opera has indeed been studied more and received more monetary support than other forms of theater in Taiwan. However, there has also been a competing movement towards advocating native opera to differentiate Taiwan from the mainland. In September of 1990, when the Kuomintang government participated in a state-sponsored mainland cultural event for the first time, a Taiwanese opera group was sent, possibly to emphasize "Taiwaneseness". During the second half of the twentieth century, Beijing opera witnessed a steady decline in attendance numbers. This has been attributed both to a decrease in performance quality and an inability of the traditional opera form to capture modern life. Furthermore, the archaic language of Beijing opera required productions to utilize electronic subtitles, which hampered the development of the form. The influence of Western culture has also left the younger generations impatient with the slow pace of Beijing opera. Starting in the 1980s, Beijing opera began to see reforms such as the creation of a school of performance theory to increase performance quality, utilization of modern elements to attract new audiences, and performance of new plays outside of the traditional canon. However, these reforms have been hampered by both a lack of funding and a sensitive political climate that makes the performance of new plays difficult. In addition to more formal reform measures, Beijing opera troupes during the 1980s also adopted unofficial changes. Some of those seen in traditional works, called "technique for technique's sake," include the use of extended high pitch sequences by female Dan, and the addition of lengthier movement sections and percussion sequences to traditional works. Such changes have generally been met with disdain by Beijing opera performers, who see them as ploys to gain immediate audience appeal. Plays with repetitive sequences have also been shortened to hold audience interest. New works have naturally experienced a greater freedom to experiment. 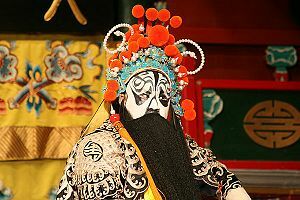 Regional, popular, and foreign techniques have been adopted, including Western-style makeup and beards, and new face paint designs for Jing characters. The spirit of reform continued during the 1990s. To survive in an increasingly open market, troupes like the Shanghai Jingju Company have brought traditional Beijing opera to new audiences by offering an increasing number of free performances in public places. There has also been a general sense of a shift in the creative attribution of Beijing opera works. 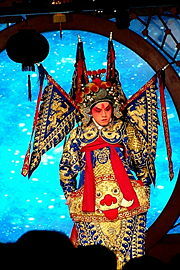 The performer has traditionally played a large role in the scripting and staging of Beijing opera works. However, perhaps following the lead of the West, Beijing opera in recent decades has shifted to give more control to the director and playwright. Performers have striven to introduce innovation in their work while heeding the call for reform from this new upper level of Beijing opera producers. Channel CCTV-11 in mainland China is currently dedicated to broadcasting classic Chinese opera productions, including Beijing opera. In addition to its presence in mainland China, Beijing opera has spread to Hong Kong, Taiwan, and overseas Chinese communities elsewhere. Mei Lanfang, one of the most famous Dan performers of all time, was one of the greatest popularizers of Beijing opera abroad. During the 1920s, he performed Beijing opera in Japan. This inspired an American tour in February of 1930. Although some, such as the actor Otis Skinner, believed that Beijing opera could never be a success in the United States, the favorable reception given Lanfang and his troupe in New York City disproved this notion. The performances had to be relocated from the 49th Street Theater to the larger National Theater, and the duration of the tour extended from two weeks to five. Lanfang traveled across the United States, receiving honorary degrees from the University of California and Pomona College. He followed this tour with a tour in the Soviet Union in 1935. Becoming a Beijing opera performer requires a long and arduous apprenticeship beginning from an early age. Prior to the twentieth century, pupils were often handpicked at a young age by a teacher and trained for seven years on contract with the child's parents. Since the teacher fully provided for the pupil during this period, the student accrued a debt to his master that was later repaid through performance earnings. After 1911, training took place in more formally organized schools. Students at these schools rose as early as five o'clock in the morning for exercises. Daytime was spent learning the skills of acting and combat, and senior students performed in outside theaters in the evening. If they made any mistakes during such performances, the entire group was beaten with bamboo canes. Schools with less harsh training methods began to appear in 1930, but all schools were closed down in 1931 after the Japanese invasion. New schools were not opened until 1952. Performers are first trained in acrobatics, followed by singing and gestures. Several schools of performance are taught, all based on the styles of famous performers, such as Mei Lanfang, Cheng Yanqiu, Ma Lianliang, and Qi Lintong. Students previously trained exclusively in the art of performance, but modern opera schools now include academic studies as well. Teachers assess the qualifications of each student and assign them roles as primary, secondary, or tertiary characters accordingly. Students with little acting talent often become Beijing opera musicians. They may also serve as the supporting cast of foot soldiers, attendants, and servants that is present in every Beijing opera troupe. In Taiwan, the Ministry of National Defense of the Republic of China runs a national Beijing opera training school. The Sheng (生) is the main male role in Beijing opera. This role has numerous subtypes. The laosheng is a dignified older role. These characters have a gentle and cultivated disposition and wear sensible costumes. One type of laosheng role is the hongsheng, a red-faced older male. The only two hongsheng roles are Guan Gong, the Chinese God of War, and Zhao Kuang-yin, the first Song Dynasty emperor. Young male characters are known as xiaosheng. These characters sing in a high, shrill voice with occasional breaks to represent the voice changing period of adolescence. Depending on the character's rank in society, the costume of the xiaosheng may be either elaborate or simple. Off-stage, xiaosheng actors are often involved with beautiful women by virtue of the handsome and young image they project. The wusheng are martial characters for roles involving combat. They are highly trained in acrobatics, and have a natural voice when singing. Troupes will always have a laosheng actor. A xiaosheng actor may also be added to play roles fitting to his age. In addition to these main Sheng, the troupe will also have a secondary laosheng. The Dan (旦) refers to any female role in Beijing opera. Dan roles were originally divided into five subtypes. Old women were played by laodan, martial women were wudan, young female warriors were daomadan, virtuous and elite women were qingyi, and vivacious and unmarried women were huadan. 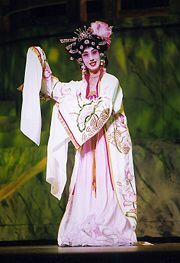 One of Mei Lanfang's most important contributions to Beijing opera was in pioneering a sixth type of role, the huashan. This role type combines the status of the qingyi with the sensuality of the huadan. A troupe will have a young Dan to play main roles, as well as an older Dan for secondary parts. Four examples of famous Dans are Mei Lanfang, Cheng Yanqiu, Shang Xiaoyun, and Xun Huisheng. In the early years of Beijing opera, all Dan roles were played by men. Wei Changsheng, a male Dan performer in the Qing court, developed the cai ciao, or "false foot" technique, to simulate the bound feet of women and the characteristic gait that resulted from the practice. The Jing (净) is a painted face male role. Depending on the repertoire of the particular troupe, he will play either primary or secondary roles. This type of role will entail a forceful character, so a Jing must have a strong voice and be able to exaggerate gestures. Beijing opera boasts 16 basic facial patterns, but there are over one hundred specific variations. The patterns and coloring are thought to be derived from traditional Chinese color symbolism and divination of the lines of a person's face, which is said to reveal personality. Easily recognizable examples of coloring include red, which denotes uprightness and loyalty, white, which represents evil or crafty characters, and black, which is given to characters of soundness and integrity. Three main types of Jing roles are often seen. These include dongchui, a loyal general with a black face who excels in singing, jiazi, a complex character played by a skilled actor, and wujing, a martial and acrobatic character. The Chou (丑) is a male clown role. The Chou usually plays secondary roles in a troupe. Indeed, most studies of Beijing opera classify the Chou as a minor role. The name of the role is a homophone of the Mandarin Chinese word chou, meaning "ugly." This reflects the traditional belief that the clown's combination of ugliness and laughter could drive away evil spirits. Chou roles can be divided into Wen Chou, civilian roles such as merchants and jailers, and Wu Chou, minor military roles. The Wu Chou is one of the most demanding in Beijing opera, because of its combination of comic acting, acrobatics, and a strong voice. Chou characters are generally amusing and likable, if a bit foolish. Their costumes range from simple for characters of lower status to elaborate, perhaps overly so, for high status characters. Chou characters wear special face paint, called xiaohualian, that differs from that of Jing characters. The defining characteristic of this type of face paint is a small patch of white chalk around the nose. This can represent either a mean and secretive nature or a quick wit. Beneath the whimsical persona of the Chou, a serious connection to the form of Beijing opera exists. The Chou is the character most associated with the guban, the drums and clapper commonly used for musically accompaniment during performances. 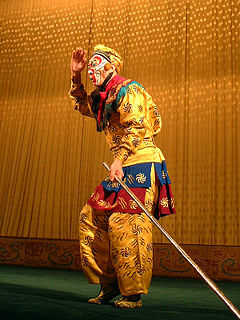 The Chou actor often uses the guban in solo performance, especially when performing Shu Ban, light-hearted verses spoken for comedic effect. The clown is also connected to the small gong and cymbals, percussion instruments that symbolize the lower classes and the raucous atmosphere inspired by the role. Although Chou characters do not sing frequently, their arias feature large amounts of improvisation. This is considered a license of the role, and the orchestra will accompany the Chou actor even as he bursts into an unscripted folk song. However, due to the standardization of Beijing opera and political pressure from government authorities, Chou improvisation has lessened in recent years. The Chou has a vocal timbre that is distinct from other characters, as the character will often speak in the common Beijing dialect, as opposed to the more formal dialects of other characters. Beijing opera performers utilize four main skills. The first two are song and speech. The third is dance-acting. This includes pure dance, pantomime, and all other types of dance. The final skill is combat, which includes both acrobatics and fighting with all manner of weaponry. All of these skills are expected to be performed effortlessly, in keeping with the spirit of the art form. Beijing opera follows other traditional Chinese arts in emphasizing meaning, rather than accuracy. The highest aim of performers is to put beauty into every motion. Performers are strictly criticized during training for lacking beauty. Additionally, performers are taught to create a synthesis between the different aspects of Beijing opera. The four skills of Beijing opera are not separate, but rather should be combined in a single performance. One skill may take precedence at certain moments during a play, but this does not mean that other actions should cease. Much attention is paid to tradition in the art form, and gestures, settings, music, and character types are determined by long held convention. This includes conventions of movement, which are used to signal particular actions to the audience. For example, walking in a large circle always symbolizes traveling a long distance, and a character straightening his or her costume and headdress symbolizes that an important character is about to speak. Some conventions, such as the pantomimic opening and closing of doors and mounting and descending of stairs, are more readily apparent. Many performances deal with behaviors that occur in daily life. However, in accordance with the overriding principle of beauty, such behaviors are stylized to be presented on stage. Beijing opera does not aim to accurately represent reality. Experts of the art form contrast the principles of Beijing opera with the principle of Mo, mimesis or imitation, that is found in western dramas. Beijing opera should be suggestive, not imitative. The literal aspects of scenes are removed or stylized to better represent intangible emotions and characters. The most common stylization method in Beijing opera is roundness. Every motion and pose is carefully manipulated to avoid sharp angles and straight lines. A character looking upon an object above them will sweep their eyes in a circular motion from low to high before landing on the object. Similarly, a character will sweep their hand in an arc from left to right in order to indicate an object on the right. This avoidance of sharp angles extends to three dimensional movement as well; reversals of orientation often take the form of a smooth, S-shaped curve. All of these general principles of aesthetics are present within other performance elements as well. Beijing opera stages have traditionally been square platforms. The action on stage is usually visible from at least three sides. The stage is divided into two parts by an embroidered curtain called a shoujiu. Musicians are visible to the audience on the front part of the stage. Traditional Beijing opera stages were built above the line of sight of the viewers, but some modern stages have been constructed with higher audience seating. Viewers are always seated south of the stage. Therefore, north is the most important direction in Beijing opera, and performers will immediately move to "center north" upon entering the stage. All characters enter from the east and exit from the west. In line with the highly symbolic nature of Beijing opera, the form utilizes very few props. This reflects seven centuries of Chinese opera tradition. The presence of large objects is frequently indicated through conventions. The stage will almost always have a table and at least one chair, which can be turned through convention into such diverse objects as a city wall, a mountain, or a bed. Peripheral objects will often be used to signify the presence of a larger, main object. For example, a whip is used to indicate a horse and an oar symbolizes a boat. The length and internal structure of Beijing opera plays is highly variable. Prior to 1949, zhezixi, short plays or plays made up of short scenes from longer plays, were often performed. 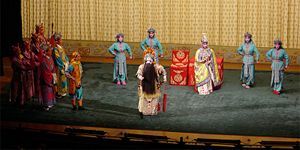 These plays usually center on one simple situation or feature a selection of scenes designed to include all four of the main Beijing opera skills and showcase the virtuosity of the performers. This format has become less prevalent in recent times, but plays of one act are still performed. These short works, as well as individual scenes within longer works, are marked by an emotional progression from the beginning of the play to the end. For example, the concubine in the one act play The Favorite Concubine Becomes Intoxicated begins in a state of joy, and then moves to anger and jealousy, drunken playfulness, and finally to a feeling of defeat and resignation. A full-length play usually has from six to fifteen or more scenes. The overall story in these longer works is told through contrasting scenes. Plays will alternate between civil and martial scenes, or scenes involve protagonists and antagonists. There are several major scenes within the work that follow the pattern of emotional progression. It is these scenes that are usually excerpted for later zhezixi productions. Some of the most complex plays may even have an emotional progression from scene to scene. Due to the scarcity of props in Beijing opera, costumes take on added importance. Costumes function first to distinguish the rank of the character being played. Emperors and their families wear yellow robes, and high ranking officials wear purple. The robe worn by these two classes is called a mang, or python robe. It is a costume suitable for the high rank of the character, featuring brilliant colors and rich embroidery, often in the design of a dragon. Persons of high rank or virtue wear red, lower ranking officials wear blue, young characters wear white, the old wear white, brown, or olive, and all other men wear black. On formal occasions, lower officials may wear the kuan yi, a simple gown with patches of embroidery on both the front and back. All other characters, and officials on informal occasions, wear the chezi, a basic gown with varying levels of embroidery and no jade girdle to denote rank. All three types of gowns have water sleeves, long flowing sleeves that can be flicked and waved like water, attached to facilitate emotive gestures. Tertiary characters of no rank wear simple clothing without embroidery. Hats are intended to blend in with the rest of the costume and will usually have a matching level of embroidery. Shoes may be high or low soled, the former being worn by characters of high rank, and the latter by characters of low rank or acrobatic characters. The accompaniment for a Beijing opera performance usually consists of a small ensemble of traditional melodic and percussion instruments. The lead melodic instrument is the jinghu, a small high pitched two string spike fiddle. The second is the circular bodied plucked lute, the ruan. Performances are begun with rigorous beating of the daluo and xiaoluo, large and small cymbals that call the audience to their places. The two main musical styles of Beijing opera, Xipi and Erhuang, originally differed in subtle ways. In the Xipi style, the strings of the jinghu are tuned to the keys of A and D. The melodies in this style are very disjointed, possibly reflecting the style's derivation from the high and loud melodies of the Qinqiang opera of northwestern China. It is commonly used to tell joyous stories. In Erhuang, on the other hand, the strings are tuned to the keys of C and G. This reflects the low, soft, and despondent folk tunes of south-central Hubei province, the style's place of origin. As a result, it is used for lyrical stories. Both musical styles have a standard meter of two beats per bar. The two musical styles share six different tempos, including manban (a slow tempo), yuanban (a standard, medium-fast tempo), kuai sanyan ("leading beat"), daoban ("leading beat"), sanban ("rubato beat"), and yaoban ("shaking beat"). The xipi style also utilizes several unique tempos, including erliu ("two-six"), and kuaiban (a fast tempo). Of these tempos, yuanban, manban, and kuaiban are most commonly seen. The tempo at any given time is controlled by a percussion player who acts as director. Erhuang has been seen as more improvisational, and Xipi as more tranquil. The lack of defined standards among performance troupes and the passage of time may have made the two styles more similar to each other today.The melodies played by the accompaniment mainly fall into three broad categories. The first is the aria. The arias of Beijing opera can be further divided into those of the Erhuang and Xipi varieties. An example of an aria is wawa diao, an aria in the Xipi style that is sung by a young Sheng to indicate heightened emotion. The second type of melody heard in Beijing opera is the fixed-tune melody, or qupai.. These are instrumental tunes that serve a wider range of purposes than arias. Examples include the "Water Dragon Tune" (shui long yin), which generally denotes the arrival of an important person, and "Triple Thrust"(ji san qiang), which may signal a feast or banquet. The final type of musical accompaniment is the percussion pattern. Such patterns provide context to the music in ways similar to the fixed-tune melodies. For example, there are as many as 48 different percussion patterns that accompany stage entrances. Each one identifies the entering character by his or her individual rank and personality. The repertoire of Beijing opera includes nearly 1,400 works. The plays are mostly taken from historical novels or traditional stories about civil, political and military struggles. Early plays were often adaptations from earlier Chinese theatre styles, such as kunqu. Nearly half of 272 plays listed in 1824 were derived from earlier styles. With such a large number of plays, it is not surprising that many different classification systems have been used over time to sort them. Two traditional methods have existed since Beijing opera first appeared in China. The oldest and most generally used system is to sort plays into civil and martial types. Civil plays focus on the relationships between characters, and feature personal, domestic, and romantic situations. The element of singing is frequently used to express emotion in this type of play. Martial plays feature a greater emphasis on action and combat skill. The two types of play also feature different arrays of performers. Martial plays predominantly feature young sheng, jing, and chou, while civil plays have a greater need for older roles and dan. In addition to being civil or martial, plays are also classified as either daxi (serious) or xiaoxi (light). The performance elements and performers used in serious and light plays greatly resemble those used in martial and civil plays, respectively. Of course, the aesthetic principle of synthesis frequently leads to the use of these contrasting elements in combination, yielding plays that defy such dichotomous classification. Since 1949, a more detailed classification system has been put into use based on thematic content and the historical period of a play's creation. The first category in this system is chuantongxi, traditional plays that were in performance prior to 1949. The second category is xinbian de lishixi, historical plays written after 1949. This type of play was not produced at all during the Cultural Revolution, but is a major focus today. The final category is xiandaixi, contemporary plays. The subject matter of these plays is taken from the twentieth century and beyond. Contemporary productions are also frequently experimental in nature, and may incorporate Western influences. In the second half of the twentieth century, Western works have increasingly been adapted for Beijing opera. The works of Shakespeare have been especially popular. The movement to adapt Shakespeare to the stage has encompassed all forms of Chinese opera. Beijing opera in particular has seen versions of A Midsummer Night's Dream and King Lear, among others. ↑ Colin Patrick Mackerras, "Theatre and the Taipings." Modern China 2 (4)(1976): 473–501  Retrieved November 22, 2007. ↑ Elizabeth Wichmann, "Tradition and Innovation in Contemporary Beijing Opera Performance." TDR 34 (1)(1990): 146–178 . Retrieved November 22, 2007. ↑ Nancy Yunhwa Rao, "Racial Essences and Historical Invisibility: Chinese Opera in New York, 1930" Cambridge Opera Journal 2 (2000): 135–162. . Retrieved November 22, 2007. ↑ Nancy A. Guy, "The Appreciation of Chinese Opera: A Reply to Ching-Hsi Perng." (in Forum for Readers and Authors) Asian Theatre Journal 7 (2)(1990): 254–259 . Retrieved November 22, 2007. ↑ Nancy A. Guy, "Peking Opera as "National Opera" in Taiwan: What's in a Name?" Asian Theatre Journal 12 (1) (1995): 85–103. . Retrieved November 22, 2007. ↑ Jinpei Huang, "Xipi and Erhuang of Beijing and Guangdong Operas." Asian Music 20 (2) (1989): 152–195. . Retrieved November 22, 2007. ↑ 12.0 12.1 Charles Wilson, Hans Frankel, What is Kunqu Theatre?. accessdate 2007-04-04 Wintergreen Kunqu Society, 2006. Retrieved November 22, 2007. ↑ Richard F. S. Yang, "Behind the Bamboo Curtain: What the Communists Did to the Peking Opera." Asian Theatre Journal 1969 21(1):60-66 . Retrieved November 22, 2007. ↑ Dolores Menstell Hsu, "Musical Elements of Chinese Opera." The Musical Quarterly 1964 50 (4): 439–451. . Retrieved November 22, 2007. ↑ Hui-ling Chou, "Striking Their Own Poses: The History of Cross-Dressing on the Chinese Stage." TDR 1997 41 (2): 130–152. Retrieved November 22, 2007. ↑ Daniel S. P. Yang, | "Censorship: 8 Model Works." The Drama Review 1971 volume= 15 (2):258–261. . Retrieved November 22, 2007. ↑ Mackerras, Colin Drama and Politics in the China of the Twelfth Party Congress. Asian Theatre Journal 1984 1 (2):147–165. . Retrieved November 23, 2007. ↑ Nancy Guy, "Governing the Arts, Governing the State: Peking Opera and Political Authority in Taiwan." Ethnomusicology 1999 43 (3): 508–526. . Retrieved November 23, 2007. ↑ Ching-Hsi Perng, "At the Crossroads: Peking Opera in Taiwan Today." Asian Theatre Journal 1989 6 (2):124–144. .Retrieved November 23, 2007. ↑ Huei-Yuan Belinda Chang, "A Theatre of Taiwaneseness: Politics, Ideologies, and Gezaixi." TDR 1997 41 (2):111–129. . Retrieved November 23, 2007. ↑ Catherine Diamond, "Kingdom of Desire: The Three Faces of Macbeth (in Report)" Asian Theatre Journal 1994 11 (1): 114–133. . Retrieved November 23, 2007. ↑ Elizabeth Wichmann-Walczak, "Reform" at the Shanghai Jingju Company and Its Impact on Creative Authority and Repertory." TDR 2000 44 (4): 96–119. . Retrieved November 23, 2007. ↑ Elizabeth Wichmann, "Xiqu Research and Translation with the Artists in Mind (in Symposium: What More Do We Need to Know about Chinese Theatre?)" Asian Theatre Journal 1994 11 (1): 96–119. . Retrieved November 23, 2007. ↑ Georges Banu, Ella L. Wiswell, June V. Gibson, "Mei Lanfang: A Case against and a Model for the Occidental Stage." Asian Theatre Journal 1986 3 (2):153–178 . Retrieved November 23, 2007. ↑ Donald Chang, John D. Mitchell, Roger Yeu, "How the Chinese Actor Trains: Interviews with Two Peking Opera Performers (in Asian Theatre Traditions)" Educational Theatre Journal 1974 26 (2): 183–191. Retrieved November 23, 2007. ↑ Richard F. S. Yang, "The Performing Arts in Contemporary China" (in Book Reviews) Asian Theatre Journal 1984 1 (2): 230–234. . Retrieved November 23, 2007. ↑ 46.0 46.1 Xu Chengbei. Afternoon Tea at the Beijing Opera. . (Long River Press, 2006), 163. Retrieved November 23, 2007. ↑ Joshua Goldstein, "Mei Lanfang and the Nationalization of Peking Opera, 1912–1930." East Asian Cultures Critique 1999 7 (2): 377–420. . Retrieved November 23, 2007. ↑ David Der-wei Wang, "Impersonating China (in Essays and Articles)" Chinese Literature: Essays, Articles, Reviews (CLEAR) 2003 25: 133–163. . Retrieved November 23, 2007. ↑ Barbara E. Ward, "Not Merely Players: Drama, Art and Ritual in Traditional China." Man, New Series 1979 14 (1): 18–39. . Retrieved November 23, 2007. ↑ Jingsong Chen, "To Make People Happy, Drama Imitates Joy: The Chinese Theatrical Concept of Mo." Asian Theatre Journal 1997 14 (1): 38–55. . Retrieved November 23, 2007. ↑ Chunfang Faye Fei, William Huizhu Sun, "Othello and Beijing Opera: Appropriation As a Two-Way Street." The Drama Review 2006 50 (1): 120–133. . Retrieved November 23, 2007. ↑ Zha Peide, Tian Jia, "Shakespeare in Traditional Chinese Operas (in Shakespeare in China)" Shakespeare Quarterly 1988 39 (2): 204–211. . Retrieved November 23, 2007. ↑ J. Philip Brockbank, "Shakespeare Renaissance in China (in Shakespeare in China)" Shakespeare Quarterly 1988 39 (2): 195–204. . Retrieved November 23, 2007. Chengbei Xu, with Yawtsong Lee (Translator). Afternoon Tea at the Beijing Opera. Long River Press, 2006. ISBN 9781592650576. Bonds, Alexandra B. 2008. Beijing opera costumes the visual communication of character and culture. Honolulu: University of Hawai'i Press. ISBN 9780824829568. Goldstein, Joshua S. Drama Kings: Players and Publics in the Re-creation of Peking Opera, 1870–1937. University of California Press, 2007. Heisey, D. Ray. 2000. Chinese perspectives in rhetoric and communication. Advances in communication and culture. Stamford, CT: Ablex Pub. Corp. ISBN 1567504949. Mackerras, Colin Patrick, "Theatre and the Taipings." Modern China 2 (4)(1976): 473–501. Um, Hae-kyung. 2005. Diasporas and interculturalism in Asian performing arts translating traditions. (RoutledgeCurzon—IIAS Asian studies series.) New York: RoudledgeCurzon. ISBN 0203641906. Wichmann, Elizabeth. 1991. Listening to theatre the aural dimension of Beijing Opera. Honolulu: University of Hawaii Press. ISBN 0824812212. Yan, Liang. 2003. A primer of Beijing opera. Beijing, China: Foreign Languages Press. ISBN 7119032887. This page was last modified on 16 January 2013, at 19:46.